Holy cow! It's Hornetroid! It took a while to track this box down, but boy was it worth it! The artwork on the front of the box is in the same vein as the card art for the aliens, and every bit as ominous looking! The box looks bigger here than it is in real life. In fact, it's almost disappointing how small it really is. From this angle, you also get the feeling that the people grabber in front between the pincers is supposed to be a tongue of sorts. Combined with the menacing pincers, the tongue goes a long way towards making the Hornetroid look quite fearsome. 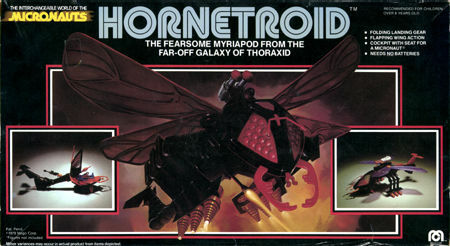 Still one of the best of the Micronauts vehicles. Makes one wonder where the line would have gone had Mego not gone bankrupt.